Different cultures are associated with particular bladed weapons: American frontiersmen with bowie knives, Gurkhas with kukris, Scots with dirks, Filipinos with bolos, etc. The bladed weapon most associated with the tribes of southern Africa would not be a knife or dagger, but an assegai, or spear. The assegai often served the purpose of a knife, being used not only in fighting but in dressing game, carving wooden implements, and even shaving the scalp. At the end of the chapter is a discussion of the knob-kerrie, which I found too interesting to omit. We will now see how the native makes his assagai. With their simple tools the native smiths contrive to make their spear heads of such an excellent temper that they take a very sharp edge: so sharp, indeed, that the assagai is used, not only for cutting up meat and similar offices, but for shaving the head. Also, it is so pliable, that a good specimen can be bent nearly double and beaten straight again, without being heated. When the Kaffir smith has finished the head of the assagai, it looks something like the blade of a table knife before it is inserted into the handle, and has a straight projecting peg, by which it is fastened into the wooden shaft. This peg, or tang as cutlers call it, is always notched, so as to make it retain its hold the better. Now comes the next process. The spear maker has already by him a number of shafts. These are cut from a tree which is popularly called "assegai-wood," and on the average are nearly five feet in length. In diameter they are very small, seldom exceeding that of a man's little finger at the thick end, while the other end tapers to the diameter of an ordinary black-lead pencil. The assagai-tree is called scientifically Curtisia Jaginea, and is something like the mahogany. The shaft of the assagai is seldom, if' ever, sufficiently straight to permit the weapon to be used at once. It is straightened by means of heating it over the fire, and then scraping, beating, and bending it until the maker is pleased with the result. Even after the weapon has been made and in use, the shaft is very apt to warp, and in this case the Kaffir always rapidly straightens the assagai before he throws it. In spite of its brittle nature, it will endure a considerable amount of bending, provided that the curve be not too sharp, and that the operator does not jerk the shaft as he bends it. Indeed, if it were not for the elasticity of the shaft, the native would not be able to produce the peculiar quivering or vibrating movement, to which the weapon owes so much of its efficiency. By means of heating the "tang" of the head red hot, a hole is bored into the thick end of the shaft, and the tang passed into it. Were it left without further work, the spear would be incomplete, for the head would fall away from the shaft whenever the point was held downward. In order to fasten it in its place, the Kaffir always makes use of one material, namely, raw hide. He cuts a narrow strip or hide, sometimes retaining the hair, and binds it while still wet upon the spear. As it dries, the hide contracts, and forms a band nearly as strong as if made of iron. There is no particular art displayed in tying this band; we never see in that portion of an assagai the least trace of the elaborate and elegant patterns used by the New Zealanders in the manufacture of their weapons. The strip of hide is merely rolled round the spear and the loose end tucked beneath a fold. Yet the Kaffir is not without the power of producing such patterns, and will commonly weave very elaborate and elegant ornaments, from the hair of the elephant's tail and similar materials. These ornamental lashings are, however, always placed on the shaft of the weapon, and are never employed in fastening the head of the assagai in its place. In the illustration on page 103 is drawn a group of assagais, in order to show the chief varieties of this weapon. The whole of them have been drawn from specimens in my own possession. The word “assagai" is not a Kaffir term, but, like the popular name of the tribe, like the words kaross, kraal, &c., has been borrowed from another language. The Zulu word for the assagai is um-konto, a word which has a curious though accidental resemblance to the Latin contus. The ordinary form or "throwing assagai" is shown at fig. 5. It is used as a missile, and not as a dagger. In some cases the throwing assagai is shaped in a more simple iron head being nothing but a sharpened spike of iron, without any pretensions of being formed into a blade. This weapon is five feet seven inches in total length, and the blade measures a foot in length from its junction with the shaft. Sometimes the blade is much longer and wider, as seen at fig. 4, which represents the ordinary "stabbing assagai." This weapon can be used as a missile, but is very seldom employed except as a manual weapon. Its long, straight blade is much used in the more peaceful vocations of daily life, and a Kaffir in time of peace seldom uses it for any worse purpose than slaughtering cattle, and cutting them up afterward. This is the assagai that is usually employed as a knife, and with which the ingenious native contrives to shave his head. At fig. 7 is shown a very remarkable specimen of the barbed assagai. Intending to produce an extremely elegant weapon, the artificer has lavished much pains 'on his work. In the first place, he has forged a deeply barbed head, a form which is but rarely seen. He has then fastened it to the shaft in a rather singular way. Instead of cutting a strip of raw hide and binding it round the weapon, he has taken the tail of a calf, cut off a piece about four inches in length, drawn the skin from it so as to form a tube, and slipped this tube over the spear. As is the case with the hide lashing, the tube contracts as it dries, and forms a singularly effective mode of attaching the head to the shaft. The hair has been retained, and, in the maker's opinion, a very handsome weapon has been produced. The assagai, in its original form, is essentially a missile, and is made expressly for that purpose, although it serves several others. And, insignificant as it looks when compared with the larger and more elaborate spears of other nations, there is no spear or lancet that can surpass it in efficacy. The Kaffir, when going on a warlike or hunting expedition, or even when travelling to any distance, takes with him a bundle, or "sheaf," of assagais, at least five in number, and sometimes eight or nine. When he assails an enemy, he rushes forward, springing from side to side in order to disconcert the aim of his adversary, and hurling spear after spear with such rapidity that two or three are in the air at once, each having been thrown from a different direction. There is little difficulty in avoiding a single spear when thrown from the front; but when the point of one is close to the heart, and another is coming to the right side, and the enemy is just hurling another on the left, it is a matter of no small difficulty to escape one or other of them. If the assailed individual stands still, he is sure to be hit, for the Kaffir's aim is absolute certainty; while if he tries to escape a spear coming from the left, he will probably be hit by another coming from the right. closed, so as to bring the balance spot of the spear against the root of the hand. This movement causes the spear to vibrate strongly and is rapidly repeated, until the weapon gives out a peculiar humming or shivering noise, impossible to be described. And equally impossible to be forgotten when once heard. It is as menacing a sound as the whirr of the rattlesnake, and is used by the Kaffirs when they wish to strike terror into their opponents. When thrown, the assagai does not lose this vibrating movement, but seems even to vibrate stronger than before, the head describing a large arc of a circle, of which the balance point forms the centre. This vibration puzzles the eye of the adversary, because it is almost impossible to tell the precise direction which the weapon is taking. Any one can calculate the flight of a rigid missile, such as a thick spear or arrow, but when the weapon is vibrating the eye is greatly bewildered. and appears rather to be seeking its own course than to be a simple weapon thrown by the hand of a man. As it flies along it continually gives out the peculiar shivering sound which has been mentioned, and this adds to the delusion of its aspect. An illustration on page 111 represents a group of Kaffir warriors engaged in a skirmish. In the present instance they are exhibiting their prowess in a mock fight, the heads of the assagais being of wood instead of iron, and blunted, but still hard and sharp enough to give a very severe blow — experto crede. In the background are seen a number of soldiers standing behind their shields so as to exemplify the aptness of their title, the Matabele, or Disappearers. In the immediate foreground is a soldier in the full uniform of his regiment. He has just hurled one assagai, and, as may be seen by the manner in which his dress is flying, has leaped to his present position with another assagai ready in his hand. Two soldiers are plucking out of the ground the assagais thrown by their antagonists, covering themselves with their shields while so doing. All these soldiers belong to the same regiment, as may be seen by the headdress, which constitutes their distinctive uniform. The skill displayed by the Kaffirs in the use of this weapon is really surprising. The rapidity with which the assagais are snatched from the sheaf, poised, quivered, and hurled is almost incredible. We are told that the great mastery of the old English archers over the powerful bows which they used, was not so much owing to the personal strength of the archer, as to the manner in which he was taught to "lay his body in his bow," and thus to manage with ease a weapon that much stronger men could not draw. In a similar manner, the skill of the Kaffir in hurling the assagai is attributable not to his bodily strength, but to the constant habit of using the weapon. As soon as a boy can fairly walk alone, he plays at spear throwing — throwing with sticks; and as he grows up, his father makes sham assagais for him, with wooden instead of iron heads. Two of these mock weapons are shown at fig 8 in the illustration on p. 103. They exactly resemble the ordinary assagai, except that their heads are of wood; and if one of them happened to hit a man, it would inflict rather an unpleasant wound. When the Kaffir grasps his assagai, he and the weapon seem to become one being, the quivering spear seeming instinct with life imparted to it by its wielder. In hurling it, he assumes intuitively the most graceful of attitudes, reminding the observer of some of the ancient statues, and the weapon is thrown with such seeming ease that, as a sojourner among them told me, "the man looks as if he were made of oil." As he hurls the weapon, he presses on his foe, trying to drive him back, and at the same time to recover the spent missiles. Sometimes, when he has not space to raise his arm, or when he wants to take his foe by surprise, he throws the assagai with a kind of underhand jerk, his arm hanging at full length. An assagai thus delivered cannot be thrown so far as by the ordinary method, but it can be propelled with considerable force, and frequently achieves the object for which it was intended. He never throws the last of the sheaf, but if he cannot succeed in picking up those that are already thrown, either by himself or his enemy, he dashes forward, and, as he closes with the foe, snaps the shaft of the assagai in the middle, throws away the tip, and uses the remaining portion as a dagger. ruse became evident enough when the action commenced. If the weapon went true to its mark, it pierced the body of the foe just as effectually as if nothing had been done to it; while if it missed, and struck the ground or a shield, the shaft instantly snapped, and the weapon was thereby rendered useless to the foe. Unknowingly, the barbaric chief copied the example that was set by a Roman general nearly two thousand years ago. When Marius made war against the Cimbri, his troops carried the short heavy javelin, called the pilum. This weapon had a thick handle, to the end of which the long blade was attached by two iron rivets, one in front of the other. Before going to battle, he ordered the soldiers to remove the rivet farthest from the point, and to supply its place with a slight wooden peg, just strong enough to hold the head in its proper position as long as no force was used. When the javelin was hurled, the enemy tried to receive it on their shields; and if they succeeded in doing so, they drew out the weapon and flung it back at the foe. But as soon as the action began, the Cimbri found themselves in a sore strait. No sooner had they caught the javelin in their shields, than the slight wooden peg snapped, and allowed the shaft to dangle from the blade. Not only was the weapon useless, but it became a serious incumbrance. It could not be pulled out of the shield, as it afforded no grasp, and the heavy shaft dragged on the ground so as to force the soldier to throw away his shield, and to fight without it. of wonderful intellect, dauntless courage, singular organizing power, and utterly devoid of compassion. Retaining the assagai, he altered its shape, and made it a much shorter and heavier weapon, unfit for throwing, and only to be used in a hand-to-hand encounter. After arming his troops with this modified weapon, he entirely altered the mode of warfare. in running away, he was instantly killed by the chief, and the same punishment awaited any one who returned from battle without his spear and shield. Owing to these tactics, he raised the tribe of the Amazulu to be the most powerful in the country. He absorbed nearly sixty other tribes into his own, and extended his dominions nearly half across the continent of Africa. He at last formed the bold conception of sweeping the whole South African coast with his armies, and extirpating the white inhabitants. But, while at the zenith of his power, he was treacherously killed by two of his brothers, Dingan and Umlangane. The two murderers fought for the kingdom on the following day, and Dingan ascended the throne over the bodies of both his brothers. The sanguinary mode of government which Tchaka had created was not likely to be ameliorated in such hands, and the name of Dingan was dreaded nearly as much as that of his brother. His successor and brother, Panda, continued to rule in the same manner, though without possessing the extraordinary genius of the mighty founder of his kingdom, and found himself obliged to form an alliance with the English, instead of venturing to make war upon them. Tchaka's invention of the single stabbing assagai answered very well as long as the Zulus only fought against other tribes of the same country. But, when they came to encounter the Dutch Boers, it was found that the stabbing assagai was almost useless against mounted enemies, and they were obliged to return to the original form of the weapon. I'm repeating this image so the reader does not have to scroll up. If the reader will refer to the illustration which has already been mentioned, he will see two specimens of the short stabbing assagai with the large blade. A fine example of this weapon is seen at fig. 1. The reader will see that the blade is extremely wide and leaf shaped, and that the other end, or but of the spear, is decorated with a tuft of hairs taken from the tail of a cow. Another example is seen at fig. 3. The maker has bestowed great pains on this particular weapon. Just at the part where the spear balances, a piece of soft leather is formed into a sort of handle, and is finished off at either end with a ring made of the wire-like hair of the elephant's tail. Several wide rings of the same material decorate the shaft of the weapon, and all of them are like the well-known "Turk's-head" knot of the sailors. Fig. 6 shows another assagai, which has once had a barbed blade like that at fig. 7, but which has been so repeatedly ground that the original shape is scarcely perceptible. The spear which is drawn at fig. 13 is one of the ornamental wooden weapons which a Kaffir will use when etiquette forbids him to carry a real assagai. This particular spear is cut from one piece of wood, and is decorated according to Kaffir notions of beauty, by contrasts of black and white gained by charring the wood. The ornamental work on the shaft is thus blackened, and so is one side of the broad wooden blade. The spear shown at fig. 9 is used in elephant hunting, and will be described in a future chapter. acts are really astonishing. When cutting up slaughtered cattle, he displays as much knowledge of the various cuts as the most experienced butcher, and certainly no butcher could operate more rapidly with his knife, saw, and cleaver, than does the Kaffir with his simple assagai. For every purpose wherein an European uses a knife, the Kaffir uses his assagai. With it he cuts the shafts for his weapons, and with its sharp blade he carves the wooden clubs, spoons, dishes, and pillows, and the various utensils required in his daily life. When hurling his assagai, whether at an animal which he is hunting or at a foe, or even when exhibiting his skill to a spectator, the Kaffir becomes strongly excited, and seems almost beside himself. The sweetest sound that can greet a Kaffir's ears is the sound of his weapon entering the object at which it was aimed, and in order to enjoy this strange gratification, he will stab a slain animal over and over again, forgetful in the excitement of the moment that every needless stab injures the hide which might be so useful to him. When the chief summons his army, and the warriors go through their extraordinary performances in his presence, they never fail to expatiate on the gratification which they shall derive from hearing their assagais strike into the bodies of their opponents. in skirmishes from the poisoned arrows of the Bosjesmans, he rejects the bow in warfare, considering it to be a weapon inconsistent with the dignity of a warrior. He has but two weapons, the assagai and the club, and he wields the second as skilfully as the first. The clubs used by the Kaffir tribes are extremely variable in size, and rather so in form. Some of them are more than six feet in length, while some are only fourteen or fifteen inches. But they all agree in one point, namely, that they are straight, or, at all events, are intended to be so; and that one end is terminated by a knob. They are popularly known as "knob-kerries." In order to show the extreme difference of size that is found among them, several specimens are figured in the illustration on page 103. Three specimens are seen at fig. 10. That on the right hand is used as a weapon, and is wielded in a very curious manner. Not only can it be employed as a weapon with which an opponent can be struck, but it is also used as a missile, sometimes being flung straight at the antagonist, and sometimes thrown on the ground in such a manner that its elasticity causes it to rebound and strike the enemy from below instead of from above. The Australian savages possess clubs of a similar shape, and also employ the ricochet. The other two kerries are not meant as weapons. It is contrary to etiquette for a Kaffir to carry an assagai when he enters the hut of a superior, and he therefore exchanges the weapon for the innocent kerrie. And it is also contrary to etiquette to use the real assagai in dances. But, as in their dances the various operations of warfare and hunting are imitated, it is necessary for the performers to have something that will take the place of an assagai, and they accordingly provide themselves with knob-kerries about the same length as the weapons whose place they supply. One very common form of the short knob-kerrie is shown at fig. 14. This weapon is only twenty inches in length, and can be conveniently carried in the belt. At close quarters it can be used as a club, but it is more frequently employed as a missile. The Kaffir is so trained from infancy to hurl his weapons that he always prefers those which can be thrown. The force and precision with which the natives will fling these short kerries is really astonishing. If Europeans were to go after birds, and provide themselves with knobbed sticks instead of guns, they would bring home but very little game. Yet a Kaffir takes his knob-kerries as a matter of course, when he goes after the bustard, the quail, or other birds, and seldom returns without success. The general plan is for two men to hunt in concert. They walk some fifty yards apart, and when they come to any spot which seems a likely place for game, they rest their kerries on their right shoulders, so as to lose no time in drawing back the hand when they wish to fling the weapon. As soon as a bird rises, they simultaneously hurl their kerries at it, one always aiming a little above the bird, and the other a little below. If, then, the bird catches sight of the upper club, and dives down to avoid it, the lower club takes effect, while, if it rises from the lower kerrie, it falls a victim to the upper. This plan is wonderfully efficacious, as I have proved by personal experience. One of my friends and myself determined to try whether we could kill game in the Kaffir fashion. So we cut some knobbed sticks, and started off in search of snipe. As soon as a snipe rose, we flung the stick at it, and naturally missed, as it was quite beyond the range of any missile propelled by hand. However, marking the spot where it alighted, we started it afresh, and by repeating this process, we got sufficiently near to bring it within the compass of our powers, and succeeded in knocking it down. Generally the short, thick, heavily knobbed kerrie belongs rather to the Hottentot and the Bosjesman than to the Zulu, who prefers the longer weapon, even as a missile. But it is evident that the former shape of the weapon is the original one, and that the Kaffir, who derived it from its original inventor, the Hottentot, has gradually lengthened the shaft and diminished the size of the head. The material of which the kerrie is made is mostly wood, that of the acacia being frequently used for this purpose. The long knob-kerries of the Zulus are generally cut from the tree that is emphatically, though not euphoniously, named Stink-wood, on account of the unpleasant odor which it gives out while being worked. As soon as it is dry, this odor goes off, and not even the most sensitive nostril can be annoyed by it. The stink-wood is a species of laurel, and its scientific name is Luurus bullata. The most valuable, as well as the most durable knob-kerries are those which are cut out of rhinoceros horn, and a native can hardly be induced to part with a fine specimen for any bribe. In the first place, the very fact of possessing such an article shows that he must be a mighty hunter, and have slain a rhinoceros; and in the second place, its great efficacy, and the enormous amount of labor expended in carving out of the solid horn, endear it so much to him, that he will not part with it except for something which will tend to raise him in the eyes of his comrades. In England, a fine specimen of knob-kerrie, made from the horn of the white rhinoceros, has been known to fetch even ten pounds. Thus much for the offensive weapons of the Zulu Kaffir. 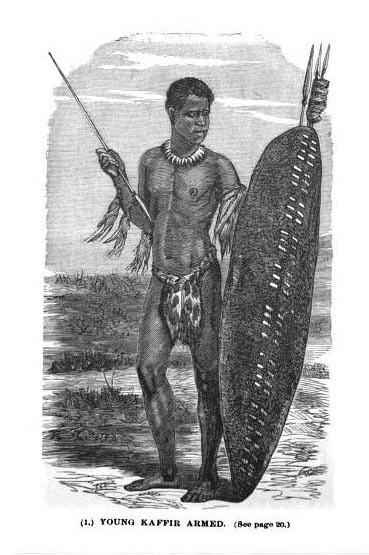 Toward the north as well as to the west of the Draakensberg Mountains, a peculiar battle-axe is used, which is evidently a modification of the barbed spear which has already been described ; but the true Zulu uses no weapon except the assagai and the kerrie. I have additional articles on the use of the assagai, including the impressions of British troops who encountered it in battle, and I will share some of those in a future post. Dear Sir, Many thanks for this article which I shall pass on to a friend of mine who has a particular interest in the Anglo/Zulu period of around 1879. Any information you may have regarding weaponry and its production or manufacture would be of much interest and greatly received. Please could you contact me via e-mail on arthurw@live.co.za if possible.